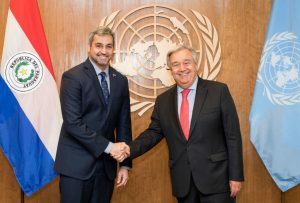 The National Chancellor, Luis Alberto Castiglioni, accompanied the President of the Republic, Mr. Mario Abdo Benítez, in the enjoyable meeting he held today at the headquarters of the United Nations with the Secretary General, Antonio Guterres, who highlighted Paraguay as a Nation of peace and democratic example for the region. In addition to Chancellor Castiglioni, the first President was accompanied by the former President of the Republic and current Director General of the Yacyretá Binational Entity, Nicanor Duarte Frutos, of the presidential spokesman, Minister Hugo Cáceres, of the Minister General Director of the State Ceremonial, Ambassador Federico González and of the Permanent Representative of Paraguay to the United Nations, Ambassador Julio César Arriola. 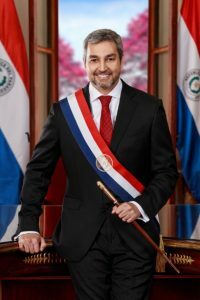 This Diplomatic Representation, attentively greets the President of the Republic of Paraguay, Mr. Mario Abdo Benitez and the Minister of Foreign Affairs, Mr. Luis Alberto Castiglioni Soria. Minister of Foreign Affairs Mr. Luis Alberto Castiglioni Soria. 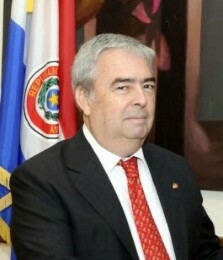 Vice Minister of Foreign Affairs, Bernandino Hugo Saguier Caballero Tuñon. 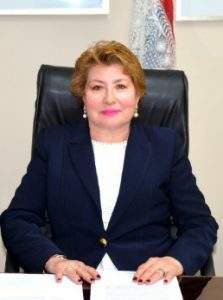 Vice Minister of Administration and Technical Affairs , Casilda del Rosario Delgado Vda. de Schneider. 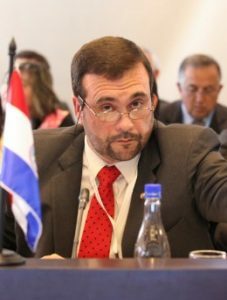 Vice Minister of Economic Relations and Integration, Juan Angel Delgadillo Franco.